Ever wondered why your carpet looks dull and extra dirty at the entrance to doors and why dull looking paths appear on your carpet. 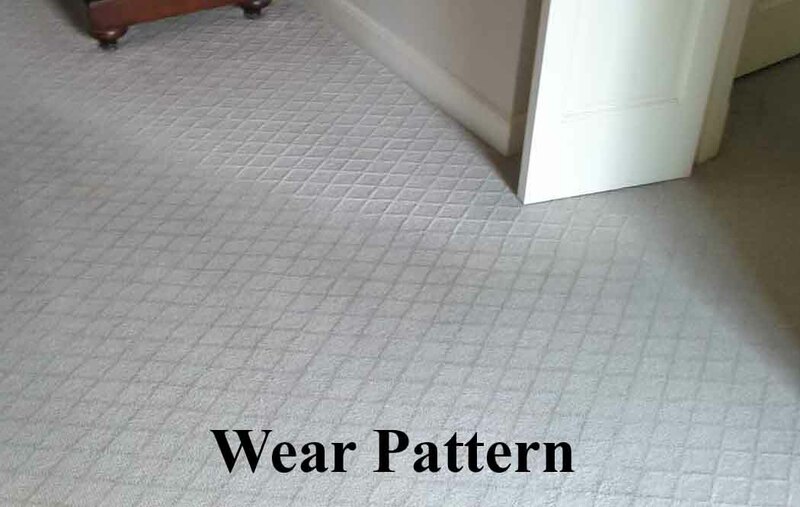 The answer is that the carpet is actually wearing away and is called a wear pattern. What creates this? People tend to drag their feet when they walk which creates wear. Especially at doorways where carpet and a hard surface meet. This is because the carpet is typically higher than the hard surface. Not only do we drag our feet a little more here but the carpet is also cleaning the dirt from our feet that accumulated on the hard surface. 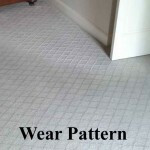 The reason wear patterns appear through rooms is that we tend to go the same way through a room. The walking and the dragging of our feet create the resulting wear. This becomes very apparent in rooms with lots of activities such as dens. Another factor that contributes to premature wear is dirt in your carpet. When we walk, the dirt grinds against the sides of the carpet fibers like sand paper and weakens the fibers. The result, at these high use areas, is that the carpet fibers get physically worn away and create a dull appearance. Also, because the fibers are frayed, they will absorb dirt, spills and such easier than the non-worn fibers. We live in our homes and carpet wear is natural. However, there are things that can be done to help reduce the affect. The biggest and best thing you can do is vacuum regularly. More than 70% of dirt in your carpet is dry particulate which vacuuming can remove. You can also look at buying higher grades of carpet which have a higher fiber count (more material per square inch just like “thread count” in linen). This can actually be a cost savings in the long run if you properly maintain the carpets. They will maintain their appearance and last longer than a lesser grade carpet. Also, avoid textured carpets in high use areas. While they look beautiful new, the textured carpets have high and low spots. The high spots will wear away quicker because there is less material to support them. The result is that traffic patterns stand out sooner. Finally, non-slip walk off mats at entrances to carpets help by capturing dirt before it hits the carpet. This will help reduce the doorway wear described above.